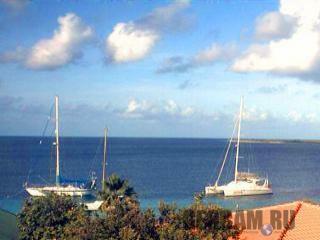 Bonaire Webcam: view from the Breathe-IT building in Kralendijk in south westerly direction towards dive site "Nearest Point" on Klein Bonaire. Updates every 15 seconds. Broadcast quality: photo, 480p. Status: camera works intermittently (checked).